Brought in as a youngster from the Urawa Reds youth set up for the 2011 season he made his debut in 2012 as we had problems with injuries at centre-back. While being brought in as an emergency he immediately looked like the real thing, composed, calm, and with a very good reading of the game and ability to get in front of his man. 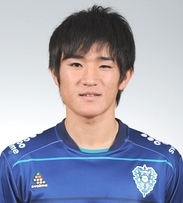 As is expected with young defenders he made a few mistakes, but in the few games he played he showed that he has the potential to be a key defensive player for Avispa in years to come. Is a little bit small for a central defender, so needs to keep studying the game and aim to be a smaller, Baresi-type reader of the game and be trying to learn as much as possible from Koga and Sakata. Has been sent out on loan to Zweigen Kanazawa and will hopefully learn a few tricks of the game to become a little nastier.